I feel as if Death Metal is one of those genres that simply needs a breath of new life from a past era. 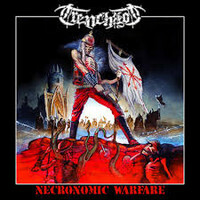 USA's TRENCHROT play the oldest of old-school death metal in its most pure, poser-less form, drawing mostly from European bands the likes of ASPHYX and BOLT THROWERS; what they have created is an honorable homage to the great death metal of the waning of the 20th century, and gave it a slight revamp with modern recording equipment. Overproduced? Nay – exactly where death metal should be. Intelligible, but still raw and unrelentingly brutal. The opening track, "Death by TrenchRot", was instantly one of my favorites. To me, it sounded like a SLAYER track, substituting Tom's brawling shouts with raw, stripped down, beaten up and downright brutal screams. What was an unrelenting pulverizing of ears turns into a somewhat more controlled, windmill-inducing passage that felt purely hypnotic… Which I was instantly broken out of by an onslaught of blast beats. "Necronomic Warfare" is similar to an old SLAYER record, in that it rarely relents in hitting you in the face until you are a bloody pulp. Let's be honest with each other; no one listens to a Death Metal record to experience soft reprieves between hurricanes. Even the slower passages are churning heavily; slowed down tempos still make way for rolling hammer falls of double bass. One such track is "Mad Dogs of War"; indeed, the track does include smatterings of blast-beats, but is dominated by heavyweight chugs and gallops played over a slow, rumbling and broken drum beat. "Maddening Aggression" does its name brutal justice; the heaviest, fastest and, I feel, most brutal track on the entire record, any monotony avoided by a few changes in tempo that sacrifice a little speed for greater heaviness and vocal presence. I also therefore feel as if this track was one of the best examples of songwriting on the album. Even the vocals seem to take on a different feeling; they sound more pained and erratic; maybe even maddened. This vocal sound meets a peak in the final track, "Necronomic Warfare". I say final, because the 3 tracks following sound like what I assume to be demo recordings from previous works. This track begins at a hellish, foreboding, epic and doom-like pace, but soon makes way for a rumbling double-kick and tremolo riff. The dominating riff of this track is odd in its arrangement; conventional Death Metal guitars are, at times, under laid by unconventional drum riffs, which, combined with the changed tone in vocals, contribute to create a completely different sound. This band definitely deserves of more attention amongst all of the world's Death Metal scenes, where one can enjoy modern flourishes, but also homages to the death metal gods of the 80s and early 90s.